Freedom Of the Road Riders Local 13 here in Mexico, Mo, Proudly Presents Moster Bash 2017....Public is Welcome...Doors will open at 5pm , Auction at 6pm, meZmer plays at 8pm.....There will be a Costume Contest....There will be Finger Foods available at 6pm....$10 per person, $15 per couple, $5 for 6-15 yrs, to get in..... All proceeds will go to Benefit The Betty Adams Toy Run!!!!!! It is BYOB as well! 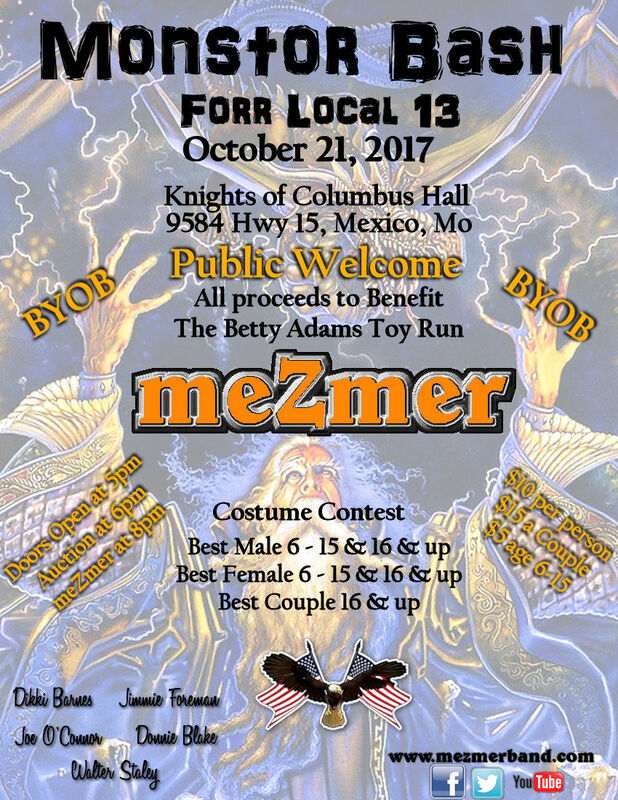 Show your support for The Betty Adams Toy Run and FORR Local 13 of Mexico, Missouri. August 26th! ......... The Boys Are Back!! 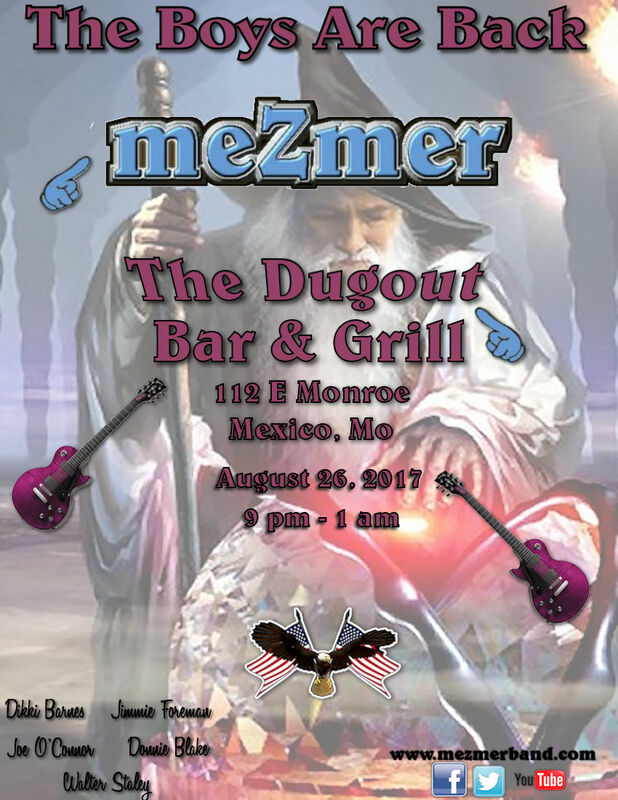 meZmer will be playing 9pm - 1am at The Dugout Bar & Grill in Mexico, Missouri so if you are in the area, Stop By and Party! We would love to see you!! 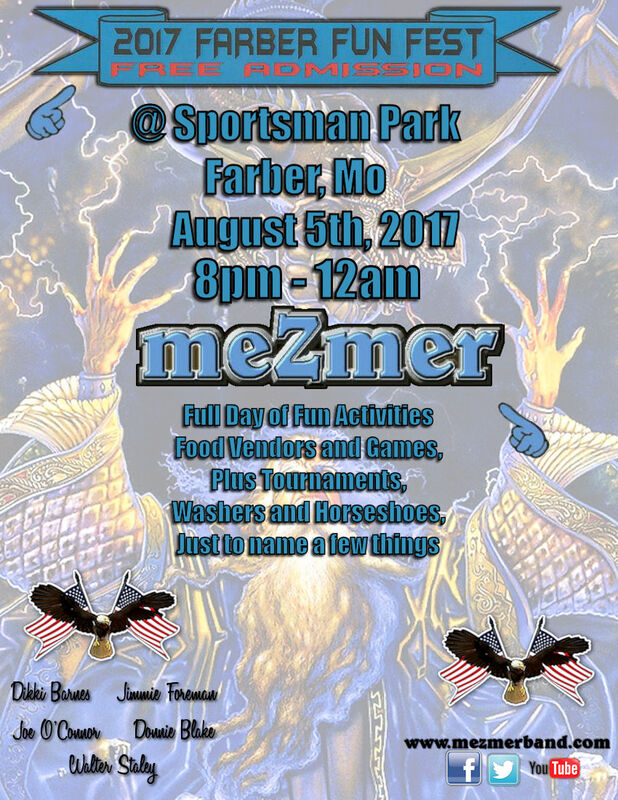 meZmer would like to Thank The Farber Fun Fest committee for having us play!! We had a Great Time and Enjoyed Ourselves.. We would like to Thank Jamie Day for the Lighting Show and Pete for running the sound...Thanks to all that came out to party and dance... Luckily We did dodge the rain as it was all around us..... We are looking forward to doing it again!! !........Farber Fun Fest Rocks! July 29th! ......... We are excited to be playing this new venue!! 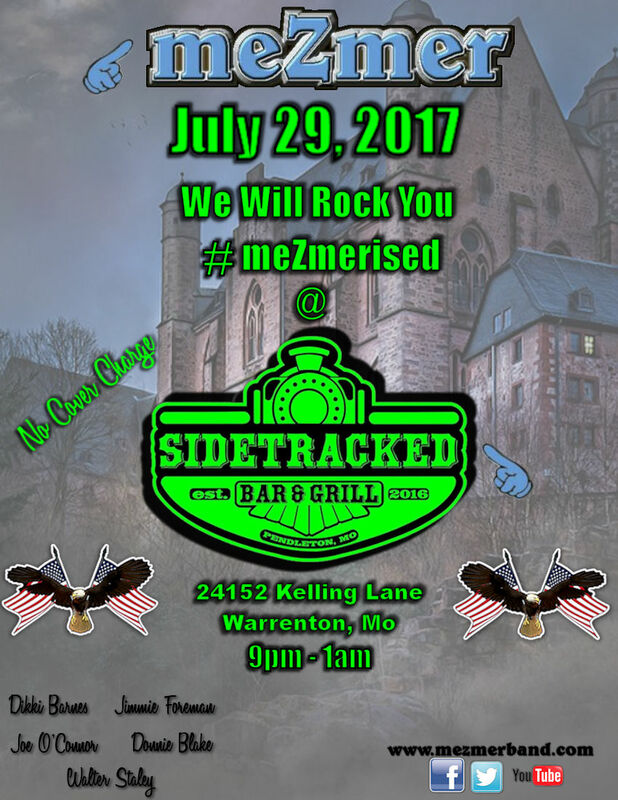 meZmer will be playing 9pm - 1am This Saturday night, at Sidetracked Bar & Grill so if you are in the area, We would love to see you!! Hey everyone!! It's been a while since we posted anything, so here goes. We have some dates that we are playing we need to let you all know about... Here are just a few of the dates: Other dates we are working on so Check Back Here to find out more. Hope to see ya there, at some of these events, or all of them!! Beginning today the web team here at the meZmer Compound will begin to update and archive many of the pages on this website. This means there will be times when many pages within this site will be temporarily unavailable. Please bare with us as we prepare for what looks like a rockin' year for meZmer! !